This past Sunday, May 18th, marked the end of the Frida Kahlo exhibit this year at the Philadelphia Museum of Art. My friend Robyn and I caught it just before its expiry along with hordes of locals who had waited till the last moment. Outside, pregnant rain clouds were birthing a fury of elements, a meteorological interruption of the Philly Jewish community’s Israel [at] 60 parade festivities taking place in Logan Circle and Ben Franklin Parkway, just outside the museum. More about the parade in another post. Robyn and I purchased our tickets and waited patiently in the long exhibit queue where we had an opportunity to look at Diego Rivera’s Liberation of the Peon (1931). Once through the entrance, we accepted the audio guides and commenced our study of the work of Frida Kahlo. Narration on the tour was provided by a device contained a small LCD screen, a keypad, and pause, stop, and play audio buttons, as well as attached earphones. To play the commentary for a particular image, one would simply press in the keypad the number listed next to the painting on the wall of the gallery. In addition to the audio commentary, informative text was also silk screened onto the walls of the gallery adjoining the paintings and photographs displayed. Frida Kahlo was born on July 6, 1907 in Coyoacán, a southern suburb of Mexico City, the third daughter of a German father and a mother of Spanish and Native American descent. 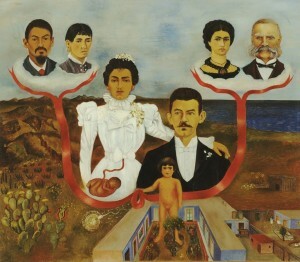 Kahlo testified “many times” about her Jewish identity, “stressing that her paternal grandparents, Henriette Kaufmann and Jakob Kahlo, were Jews from the city of Arad [in Transylvania].” Further, many people who knew Frida and Wilhelm, such as Frida’s biographer, Hayden Herrera, and Frida’s husband Diego Rivera’s biographer, Bertram Wolfe, personally repeated this fact. Frida Kahlo with her paternal grandparents, Henriette Kaufmann and Jakob Kahlo. It seemed a mistake to omit the fact that expatriate Eurpoean Jews made up an important core of the radical progressive political and art scene that Kahlo and her husband Diego inhabited, the most famous of whom was Leon Trotsky. This seems important since international political movements, socialism, communism, and anarchism accepted the contributions of Jews at a time when anti-Jewish sentiment was profound and ubiquitous. Although anti-Semitism persisted (and still persists) in the Left, Guillermo Kahlo and his daughter, could find sanctuary among contemporaries more enlightened than fascist nationalists. Perhaps the omission of Frida’s Jewish heritage in the exhibit stemmed from ambivalence as to what to make of Jewish identity, secular/religious/national/ethnic/racial Jewish identity, let alone consider the specific question of how Frida understood herself as a Jew or of Jewish ancestry. Now I understand Judaism as not only a religion but also as a civilization with an enduring culture, the religious aspect of which cannot be easily or honestly excised. Judaism is the inspiration for Zionism, a modern nationalist and socialist movement of liberation and self-determination. So it’s omplicated and I don’t expect other Jews and especially non-Jewish art historians to think like Rabbi Mordecai Kaplan on this subject. 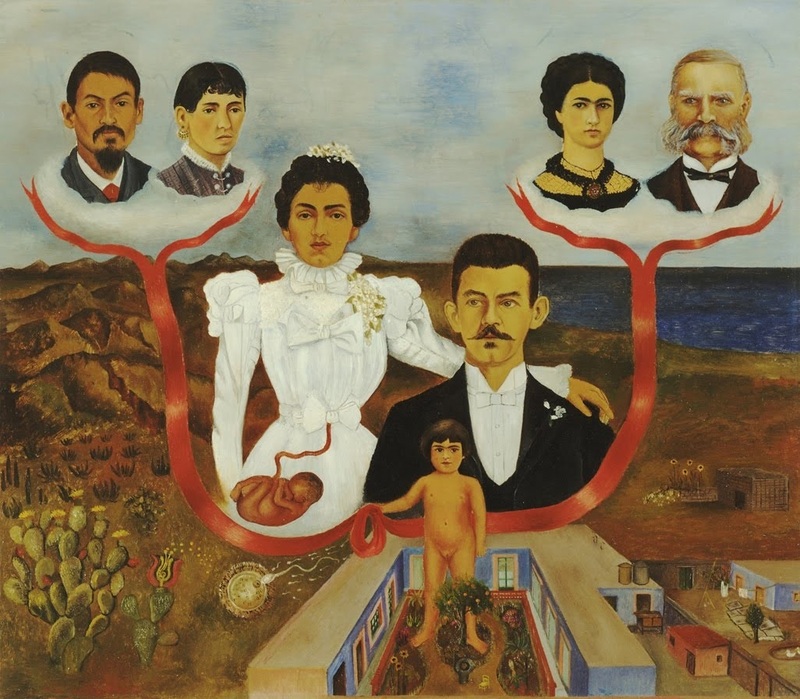 If Kahlo’s Jewish ancestry was only understood to be a religious identity, then commenting on her Jewish parentage might be considered irrelevant and misleading. But what did Kahlo think of her Jewish heritage? How did she self-identify? 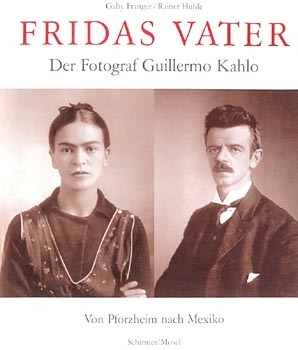 In 2005, Frida Kahlo’s genealogy on her father’s side was established by historical researchers Gaby Franger and Rainer Huhle for their book on Guillermo Kahlo’s photographic work, Fridas Vater: Der Fotograf Guillermo Kahlo (2005). The historians learned that Guillermo Kahlo was the scion of a long line of German Lutheran Protestants. Left uncertain was whether Frida’s Jewish ancestry was through her paternal grandmother, Henriette Kaufmann, or a complete fiction. Personally, I’ll take Frida at her word. As cruel as it seems to me for an art exhiition curator to ignore Frida’s Jewish identity, it seems even more obnoxious to question it. I imagine that Henriette Kaufmann’s family was Jewish and hailed from Arad, not very distant from my own ancestral roots in Nagyvárad, Transylvania. Perhaps more interesting than these genealogical questions is why Frida felt it important to claim and draw attention to her Jewish ancestry. What was the socio-cultural context that motivated her? Was Frida’s identification with Jews encouraged by her father or in the shadow of the Nazi’s terror, might he have preferred this to have remained a secret? 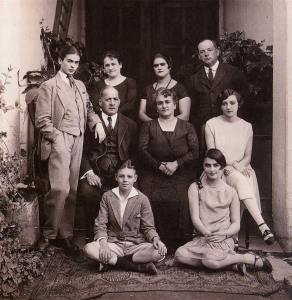 Was it in vogue to have Jewish ancestry in artsy socialist circles in Mexico City? Or was Kahlo, in identifying her genealogy with Jews during the 1930s, declaring solidarity with another ethnic minority oppressed by fascists at the onset of Hitler’s campaign of extermination? But later in Wecker’s article, Ankori does consider Wilhelm Kahlo’s “real religion” to be of interest, since besides Kahlo’s penchant for and mastery of her self-constructed image, she may very well have building a family tree to satisfy any doubts of her father’s identity in terms of both halakha (Jewish ritual law) and the Nazi’s ancestry laws. In short, what is relevant for Kahlo herself is whether her genealogy is Jewish enough to be murdered with her adopted semitic compatriots. 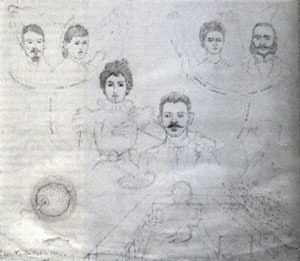 To Ankori, the question is whether Henriette Kaufmann was Jewish, since her Jewishness would make Wilhelm Jewish “according to both Jewish Halakha and Nazi laws.” If instead Wilhelm was a German Lutheran (Ankori says Lutheran, while Ronnen wrote Protestant), “why would Frida Kahlo ‘create’ a Hungarian Jewish genealogy for him and for herself?” Ankori wondered. Even after Franger and Huhle’s book, for Jason Steiber, archivist at the NMWA, Kahlo remains a Jewish artist. So I’ve been thinking about all of this and I’m left with an important quote that Wecker brings from an email in conversation with, Robin Cembalest, executive editor of ARTNews magazine, reveals the other side to the fascination with the question of Kahlo’s heritage. I think this is a remarkably clarifying and frustrating statement — clarifying in how it articulates how ethnic pride is commonly expressed by appropriating the achievements of individuals as evidence of community capabilities. It puts its finger on just that messy spot that an art historian might want to avoid in framing an artist’s life and work for public review. If art historians cannot see beyond chauvinist ethnic boosterism to understand the importance of identity politics in the lives and art of artists, then they are willingly blinding themselves to significant contextual meaning in understanding how artists like Frida understood themselves. I wonder what Frida would make of these questions and what she might say to art historians who might omit her Jewish identity. I am proud of Frida Kahlo’s defiant solidarity with Jews in the face of fascism. But I want to underscore that as much as I feel this team pride (yay Jews! 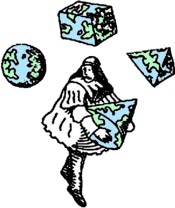 ), I’d rather find in Frida yet another voice in what I consider to be an expansive psychedelic lineage woven through the universalist and panentheist fabric of esoteric and ethical Jewish thought. It calls to me. 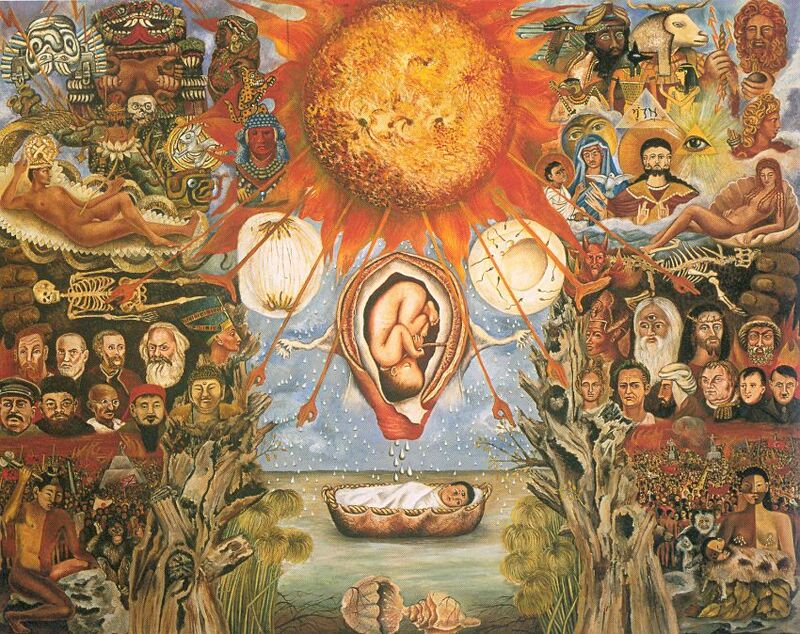 (Her work, “Moses (Nucleus of Creation)” (1945) feel expressive to me of this lineage.) We paint visions of universal liberation and call to one another with our banners, lending each other strength. None of us are alone so long as we can find one another. I am thrilled to be on her team. “On Frida Kahlo’s Jewish Identity” is shared by Aharon N. Varady with a Creative Commons Attribution-ShareAlike 4.0 International copyleft license. Could Isadore Kaufmann, Polish Painter of Jewish genre be related to Henriette Kaufman, grandmother to Frida Kahlo.